The "getting ready" portion of a wedding day is a time when spirits and emotions run high and the perfect time to capture wonderful and truly authentic moments. 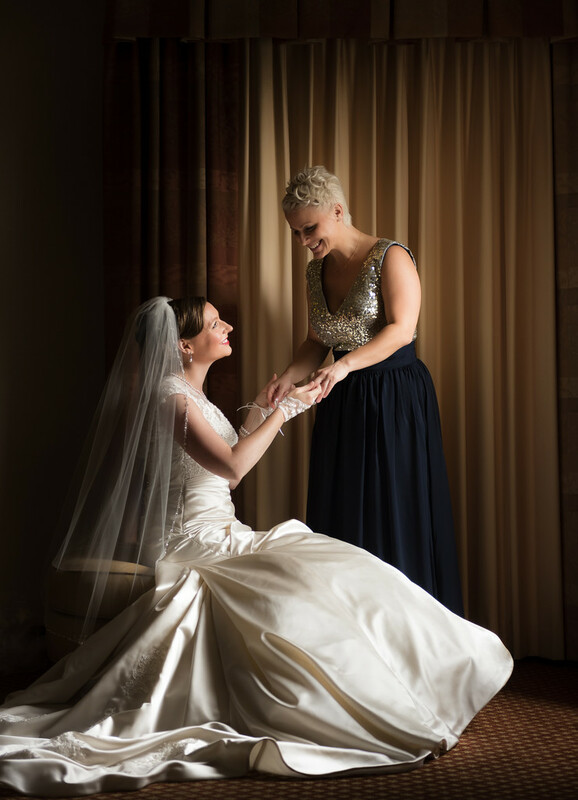 In this image, Lindsay and her bridesmaid share a moment together as they finish putting on the final accessory to her grand outfit. I waited and pressed the shutter at the final moment when they just finished putting on the hand gloves and looked at each other. There is a connection in their glances at each other the speaks about their relationship and the day that will follow. Light and shadow. While I always say that emotion and expression are the number one factor in making a beautiful portrait; the interplay of light and shadow is what makes this image really sing. I closed the blinds behind Lindsay's bridesmaid and opened the blind to camera right creating a sort of strip light illuminating the scene. The soft, directional and diffuse light from the window bathes the couple, creating interesting shadows and gradients in her dress and highlighting her face. Looking at this image you would never know there were five other bridesmaids in a chaotic looking room. Really great photography makes sense of the chaotic, incorporates great light and conveys emotion with body language and expression. I love this image as all of these critical ingredients come together perfectly.